The union, nine years ago, between the Fitzers group and the mercurial Marco Pierre White seemed an improbable one at the time. “Middle-of-the-road catering company meets ex-wunderkind chef” had the ring of doom about it, and more than one critic sat back with a sickly smile on their phizog waiting for the inevitable divorce. 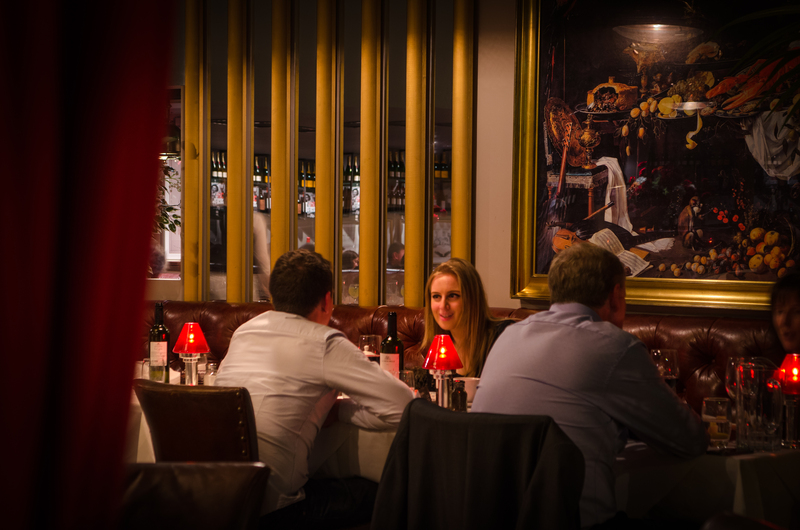 Duly solemnised by the dining public, however, the marriage endured; the Dawson Street steak emporium found a niche in the city centre’s dining milieu and the partnership was emboldened enough to open a second outlet, in Donnybrook. I had eaten in the Courtyard in pre-Marco times on a number of occasions and cannot once, despite the multiplicity of successive owners, claim to have been remotely impressed. Part of the problem was ambience or, to be precise, the lack of it. The dining space was decidedly draughty and — how can I put it? — under-dressed. Not so much “a barn” rather a sizeable stable bereft of horses, waiting for a Robert Sangster or a Mick O’Leary to fill it with life and activity. How things have changed. The other night I visited the Marco/Fitzers version and I have to say, judging solely on ambience, the Courtyard gets my vote for the best atmospherics of any restaurant in Dublin. The red, pyramid-shaped candle lamps added a unifying glow to the room — diners in pursuit of a romantic tryst must be over the moon. Despite the muted illumination it was still possible to read the menu, a surprisingly dexterous balancing act. I cannot emphasise the desirability of having a decent space between tables. True you occasionally overhear some fascinating snippets when diners are packed in like battery chicks but, in the main, other folk’s conversation cannot sustain an evening. On the night, I was accompanied by Ruby, who has dined with me on many occasions but normally comes with her bosom chum, Pearl, who is currently swanning about in Western Australia. Ruby was happy to take her three courses from the early-bird menu while I probed the à la carte. The soup of the day was asparagus, clearly a good seller because when I came to order it there was none left. I ordered the French onion soup, which turned out fair-to-decent but failed to excite. Ruby’s chicken liver parfait was, however, stunning. Firm-textured without being granular, the liver’s gaminess was offset by plump swollen raisins It i was one of the best-effected variations on this well-worn theme that I have had for many’s the year. Ruby is not a wine drinker. Her preferred tipple is a single Bacardi and Coke. Diners of mature years such as myself can recall times when, in order to drink spirits in the average restaurant, one had to resort to subterfuge. Many a handbag contained a naggin, something millennials may find hard to credit. Meanwhile, I consulted the wine list and found an intelligent but slightly overpriced selection. I contented myself with a couple of glasses: a reliable albariñho and, overriding the sommelier’s sound recommendation of bordeaux, a Victorian shiraz, to accompany my steak. I ordered a ribeye, probably my favourite cut unless I can find someone with whom to share the full bifta, the rare côte de boeuf. This one came from the upper platform of a two-tiered range. From no plebeian beast, this one was trumpeted by the menu as a “Himalayan salt-aged Delmonico 10oz ribeye”. It owes its name to the eponymous New York restaurant, and most I have had were cut from the top rib, which would, theoretically, make the Delmonico strip loin rather than ribeye. Whatever. Served with utterly mellifluous roasted bone marrow, a finely judged celeriac remoulade and triple-cooked chips, it cost a patrician €36.95. As far as pricing goes these days this seemed fair, as other places are charging as much as €50 for the salt-aged stuff. I think I will never learn to love triple-cooked chips. They always present themselves as a mutilated version of roasties, devoid of all character, but these were probably as good as it gets, which means less appealing than well-cooked “normal” chips. The steak did have fine flavour, but I cannot say with hand on heart that salt-ageing is better than other forms of dry-ageing. The one side dish we chose, a portion of creamed spinach, was poor. The spinach, even after a severe chopping, was too stalky and the cream had been sparsely administered. Ruby’s confit duck was in the “good as it gets” league, too. This is a simple dish but, in restaurants, is often appallingly rendered — either frazzled as in the fires of hell or bouncing-ball rubbery. The Courtyard version was “honey roasted” and came with a sensible accompaniment of Puy lentils, watercress and proper roasties. Ruby had a dessert. She chose the “banoffee mess”, a double portmanteau that turned out to reveal none of the personality or charm of its constituents: Eton mess and the hard-to-resist banoffee pie. Its overriding characteristic was an insanely intense sweetness, a children’s treat from the days before dentistry was invented. We paid the bill and walked back to the car, passing the comfortably upholstered courtyard — more marks for ambience — that gives the restraint its name with a certain reluctance. The Courtyard is a competent restaurant and should suit many diners, in pocket and in preferred style. I have one slight quibble. Given that Marco was memorably described as “the godfather of modern cooking”, would it be too much to ask for a couple of dishes on the menu to acknowledge his bravura dexterity and his inventiveness? Something out of the pages of White Heat, his inspiring cookbook, maybe? It’s an opportunity sadly missed. I’ll tell you right at the start – I’m a fan of Marco Pierre White. I’m a fan not only because I like his approach to food and cooking, but also because he happens to be a really nice bloke. A few years ago, I had a delightful dinner in his company at his first Irish venture – the steak house in Dawson Street. This was a joint venture with the Fitzers group and it’s still going strong. The marriage must be a good one, because they’re still together and they’ve begun a new venture in Donnybrook in The Courtyard. The Courtyard is a big space with plenty of tables both inside and outside. By all accounts, the official opening was one of the best-attended openings in Dublin for years, with Marco on hand to charm everyone who was there. The brother-in-law, Chris de Burgh, was there with daughter Rosanna and, the next day, he was on the phone to me saying that we needed to go together. So that’s what we did. We arranged to meet there on a midweek night and, just as I was arriving, I got a call from Chris telling me two things. First, he was held up for ten minutes or so and, second, that we had a third person joining us. “A surprise,” said Chris. The surprise turned out to be old friend Murrough Kavanagh and he was already at the table when I arrived. Being a big space, The Courtyard gives you plenty of room between the tables, so we had a sense of privacy and Murrough and I chatted happily until Chris joined us. The menu comes on a large sheet of card and it’s divided up into sections: hors d’oeuvres, steaks, grills and roasts, fish and side orders. The hors d’oeuvres, or starters, range in price from €6.95 for soup to €14.95 for a prawn cocktail. 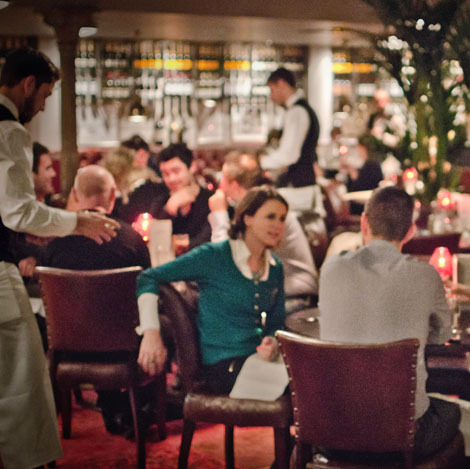 The steaks run from €26 to €34; the grills from €17.95 for a burger to €29.95 for a veal entrecote, and the fish dishes run from €24.95 for a fish pie to €40 for black sole. You can see that in each case the prices are a few euro more than you normally find, so I was curious to see would the meal live up to the price. Chris picked up the wine list and after a little while said, “How about a Malbec?” I had a few smashers this year and, unhesitatingly, said yes and so did Murrough. I took the wine list and had a look. There are only two wines under €30, one red and one white. Twelve whites and nine reds are available by the glass, ranging in price from €7.50 to €15. Again, these are higher prices than you’d normally find, but I’d balance that against a good selection of wines from very good suppliers. The Malbec was €40, and we also ordered three glasses of the rosé from Chateau Haut Rian at €9 each. My dining companions, who had the luxury of being driven home later, also managed four gin and tonics between them, while I heroically stuck with the sparkling water. Both Chris and Murrough chose the same starter, the foie gras with a duck egg served on brioche. I chose something a little lighter, the asparagus served simply with a drizzle of Hollandaise. The foie gras looked well on the plate, a circle of brioche topped with a fried duck egg and the foie gras placed on top of that. Both of these dishes were well prepared and tasted good. For mains, we’d all ordered something different. Chris had chosen the chicken Kiev, Murrough chose the black sole and I chose the steak tartare. When I asked how they presented it, I was told, “We bring it already mixed and prepared.” That may well please many people but, for me, half the enjoyment of a steak tartare is mixing it. I asked if they would let me do my own blend and they happily agreed, so I got the minced fillet, egg yolk, capers, chopped onions, mustard, chilli and olive oil and I set about making my perfect tartare. Meanwhile, Chris said his chicken Kiev was making him nostalgic, while Murrough said his sole was “really fine”. For sides, we ordered creamed spinach, Savoy cabbage and onion rings. Of the three, the onion rings were truly memorable. We did manage a couple of desserts, the sticky toffee and the Eton mess. I can’t help it, every time I see Eton mess I find myself saying, “Eton mess is soon forgotten”. I took my espresso outside where you’ll find comfy sofas and armchairs set out on carpet, making it feel very cosy. 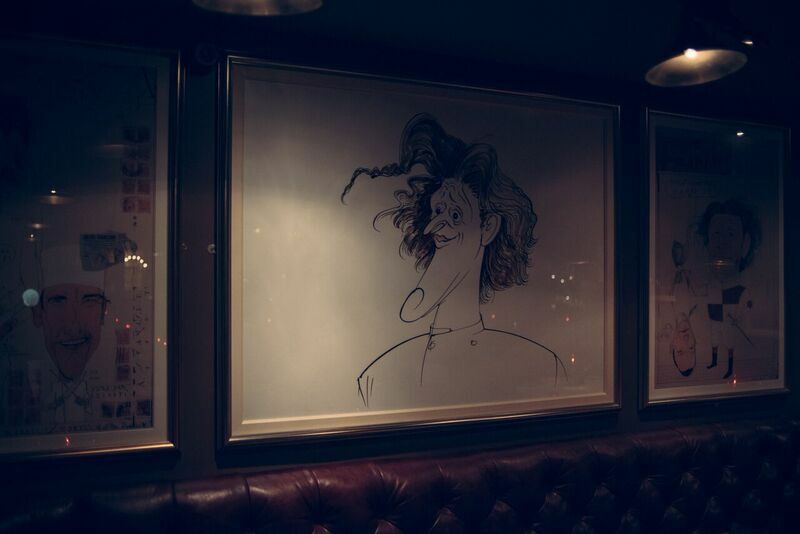 The sometime enfant terrible of the kitchen, Marco Pierre White, breezed into town recently for the opening of his second restaurant in Dublin. Unlike many of the ventures by English celebrity chefs, MPW’s restaurant in Dawson Street, in partnership with the Fitzpatrick ‘Fitzers’ family, has proved a tremendous success. Now they are expanding to the ‘burbs, the posh D4 burbs of course, where the heart of Donnybrook village has seen the opening of a number of new eateries, as well as new shops, but I guess the arrival of MPW seals its status as a dining destination. The location is the former Courtyard Restaurant, vacant for the past couple of years, which was best described as resembling an aircraft hanger. They have ‘cosied’ it up creating an almost Palm Court feel of a Victorian/Edwardian Brasserie. The ceiling has been lowered and embellished with stained glass panels, the central ‘swimming pool’ floor raised and covered with warm red carpet. Button back banquettes and curved booths surround spacious central tables and antique leather chairs, whilst the mahogany bar, which stood for many years in the Montrose Hotel, adds a focus to the room. Victorian palms and vast arrangements of hydrangeas hint of Downton. “Affordable glamour” is Marco Pierre White’s motto for modern day dining and, with bustling immaculately attired waiters in attendance, it certainly adds to the atmosphere and occasion. There is no nonsense either when it comes to food – no twiddly bits or pointless poncey too clever twists on your plate. This is classical Franco British time immemorial food – Hors d’Oeuvre, Irish Hereford steaks, Grills & Roasts and Fish Mainboards – served in a traditional style. Hors d’Oeuvre (€6.95 – €14.50) include fresh asparagus with Hollandaise; Baltimore mussels; smoked mackerel Branadade; Steak Tartare a L’Americaine; Foie Gras and duck egg en brioche; Carlingford Oysters et al. I went for the daddy of them all with the timeless irresistible Fanny Craddock creation of Dublin Bay Prawn cocktail (€14.50) which, whilst expensive, proves there is absolutely nothing to touch a chunky divine Dublin Bay prawn! Like a good Bond movie, age has not dimmed the prawn cocktail’s aura. In a tall Martini glass with shredded crispy Romaine, the chunky divine whoppers were bathed in Marie Rose sauce. Brendan’s chicken liver pate (€9.95), on the other hand was almost simple peasant style. It came in a little white dish topped with tiny soaked raisins in a Madeira jelly and two big slices of toasted rustic bread – no fuss – but confident and elegant in its simplicity. Ribeye, Sirloin and fillet steaks, (€26-€34) can be had with Béarnaise, Bordelaise or Escargot sauces and are a big part of the scene here. However, you can also have a beefburger or honey glazed pork belly both under €20, as well as a classic fish pie, grilled tuna Italian style, chicken paillard. Roast rack of Wicklow lamb Dijonaise (€29.95) proved a guard of honour brace of perfectly pink double chops set between a dome of gratin Dauphinoise and a little copper pot of mint juices. Brendan’s beautiful tranch of grilled halibut (€27.95) reflected summer days in Provençe with herbs, cherry tomatoes, Balsamic and olive oil; it was topped with baby fennel, and served with a side order of delicious crispy frites (€4.95). Puds (€8.95) again are classics including Apple Tarte Fine or rice pudding and raspberry. Again a Crème Brulee was a totally simple delicious classic. There are lots of cocktails to lead you astray and an extensive wine list from €28 – €250 but, with our more basic choice of three glasses of Sunbury Shiraz 2010 ( €9 each) and bottled water (€4.50), our bill with optional service came to €139.75. Marco Pierre White returned his 3 Michelin Stars many years ago and got on with providing good food that the customers really like – is there a message here?